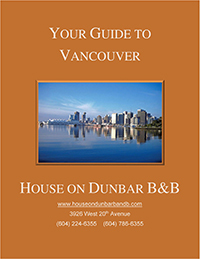 Whether it’s a business meeting, conference, social gathering or wedding, House On Dunbar B&B can accommodate your event with exceptional style and confidence. We can help plan, design and facilitate your event in a professional manner, adding the personal touches that create an atmosphere of charm and grace. For your special occasion our spacious and open main floor is the facility for you. This area is underlined by natural light and surrounded with vast greenery. Features include: Restored hand crafted entry door, antique stained glass doors, sophisticated color palette, Italian porcelain textured tiles with custom-made mosaics, fireplace with stainless-steel surrounding and hand-painted tiles inspired by Pollack’s painting, comfortable leather furnishings, art displays. Giving a sales presentation to clients? Or perhaps you need an impressive space to lay out your ambitious plan to your investors. Book House On Dunbar for your next conference event. Our sophisticated rooms will leave a lasting impression of your successful meeting and gathering in Vancouver. An intimate atmosphere combined with personal service provides the privacy that adds focus to a meeting. Casually elegant meeting rooms with natural light and access to the outdoors sets the experience apart.